What Are the Seven Healthful Reasons To Add Yogurt To The Diet? Good health has never tasted so good! You are here: Home / Nutrition / What Are the Seven Healthful Reasons To Add Yogurt To The Diet? Yogurt can provide a variety of nutrition benefits, whether eaten as a lunchtime snack or part of a main-meal. Also, yogurt is so versatile that it can be easily combined with chopped nuts or fruit, added in a smoothie or protein shake, used for dressing a salad, or with fish or poultry. The most nutritional yogurts are plain (regular or Greek style). Avoid the flavored yogurts because they often contain added sugar and calories. Yogurt is easier to digest for those unable to tolerate milk because of lactose intolerance or a protein allergy. The live active cultures make yogurt that much more digestible. Yogurt comes with enzymes like lactase and beta-galactosidase to benefit the lactose-intolerant person. Most children that are unable to tolerate cow’s milk can digest yogurt without any problem. Yogurt can benefit the colon in two different ways. Firstly, yogurt is packed with intestine friendly bacteria known as lactobacteria, which helps with promoting a healthy colon. Plus, it can offer the added benefit of reducing the risk of cancer. A high concentration of these intestine-friendly bacteria usually means a much lower chance of colon disease. Friendly bacteria help to destroy the negative substances like nitrites and nitrates, which can become carcinogenic. Plus, a second quality is the rich calcium content which helps cut the risk of colon cancer and promotes all-round health of the colon. Calcium is helpful for attacking the growth of cells lining the colon, and these cells can increase the risk of developing cancer in the future. A calcium rich diet with 1,200 mg per day has the potential to reduce the risk of colorectal cancer by nearly 75%. Yogurt is appreciated for its ability to up the bioavailability of other nutrients and increase the intake of B vitamins and calcium. The concentration of lactic acid helps to make it easier to digest and absorb the milk calcium. A regular intake of live-culture yogurt can have a significant impact on the immunity, which is increased by almost 25% compared to those that don’t eat yogurt daily. 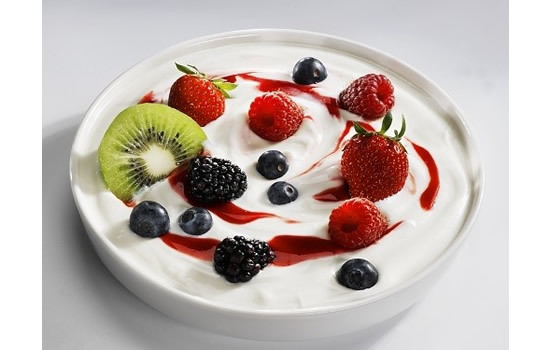 Yogurt has bacterial cultures that increase the effectiveness of white cell in the bloodstream that fight infection. Yogurt has more lactase and less lactose, which makes it that much more tolerable for those patients recovering from an intestinal infection. Plus, this food is a great choice to heal diarrhea. Yogurt is a simple and effective remedy for young children suffering from indigestion. Eating yogurt while on antibiotics can further help to relieve stomach upset while on this course of treatment. Yogurt is a rich source of calcium with each 8 ounce serving contains 450mg or 35-40% of the daily recommended intake. Plus, the live-active cultures contained in calcium make it possible for the body to absorb more of this element compared to milk. Yogurt has the potential to cut the cholesterol level in the bloodstream. A reason for this relates to the yogurts ability to bind bile acid and digest the cholesterol. The key to effective weight loss is the ability to combine the right foods, including vegetables, fruits, yogurt, etc. and eating at the right time (breakfast). Why Replace Whole Fruits and Vegetables with a Smoothie? Fatima Ducane on What Constitutes a Healthy Soup? Natisha Duell on What Are the Seven Healthful Reasons To Add Yogurt To The Diet?